I'm scraping in here with Arabella's reading challenge - vintage children's literature...which shouldn't have been a problem for me. I have bookcases full of vintage children's literature! However, the February/March period for the challenge coincided with the pre-Easter prep at work, and my blogging has taken a back seat to all of that! However, here we go, with one of my very favourite Ethel Turner books. It's not one of her particularly well-known books - the Seven Little Australians trilogy are perhaps her best-known. Three Little Maids, which is loosely autobiographical is possibly runner up. 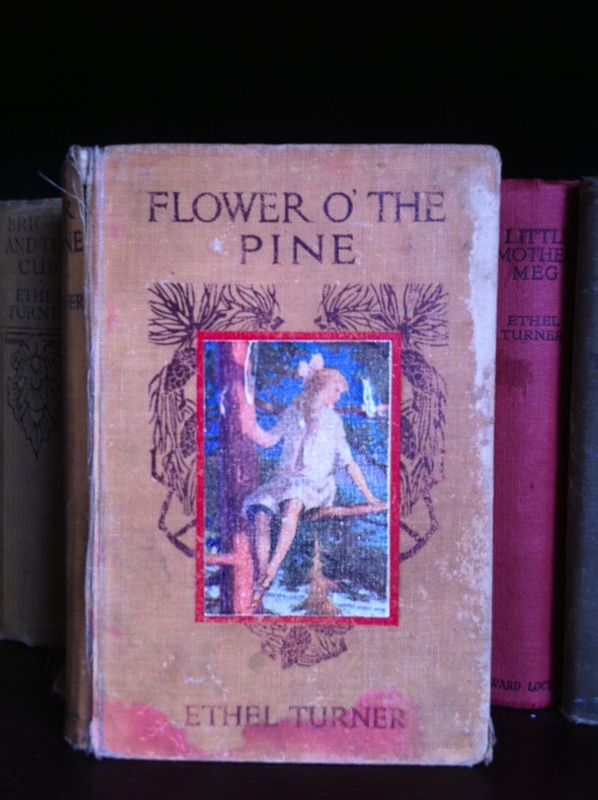 I have a soft spot for Flower o' the Pine because it's set in Manly, where I was born. We moved away from there to the inner western suburbs when I was only three and a half, so I have no memory of living on the north side of the harbour, but I grew up on stories of my mother commuting to her city job on the Manly ferry and enduring morning sickness while pregnant with me on that same trip - alleviated by either Coca Cola (she only ever drank Coke when feeling squeamish) or a large dill pickle eaten out of a paper bag! Dear Lord and Lady Tennyson, - You gave me many flowers of England - the white flowers of sleeping under his roof - the fragrant flowers of our own friendship - the blue flowers of your woods - I have few keener memories of England than the first moment when we came on those magic carpet of bluebells in your woods. Will you take in return this rough little Flower of Australia that you, too, know and love so well? The Flower in the story is a little girl, the youngest child of a family struggling to make a living far up the coast from Sydney in tropical North Queensland. Her three older brothers are growing up tough under their straightened circumstances, but little Flower is frail and it is feared that she won't survive to adulthood if she has to stay there. The story opens as the family are seeing her off to relatives in Sydney, where it is hoped she will grow stronger in the milder climate. She is facing the ordeal of going alone very bravely, but is secretly much afraid of the unknown relatives, only known by name and that they are unimaginably wealthy. The novelty of ship travel soon cheers her up and in her conquest of everyone on the ship from the Captain down sets a pattern for Flower's way with people for the rest of the book. "See that box? You couldn't guess what that was, could you, to save your life? ... It is two kerosene cases nailed together," said Flower. "First you plane them an put a lid on with hinges. Daddie did that. Then you get this nice sugar-matting stuff; only only it didn't come from sugar, it came on the box of tea from China. You tack it all over, very smoothly. Mother did that. Then you put a moulding all round to hide the tacks. Then you line it with sateen - sateen's a nice word, don't you think so - not so wealthy as satin, but nice and smooth like sateen. Then you put on a padlock, because people aren't always honest. Why aren't they? Then it's done and it gives you two shelves. Much handier than bought trunks. What do you think of it, Captain?" The Captain is hers from then on! In Sydney, our introduction to the Hume family - Mr and Mrs Hume, son, Dennis and daughter, Elizabeth, Flower's uncle, aunt and cousins - is by way of a quarrel between Elizabeth and her mother. A repeated quarrel, prompted by Elizabeth's frustration with their circumstances, her mother's seeming indifference, and what she sees as her father's weakness. The Humes live a life of deception and pretense - the great fortune they once had is gone, lost - so the elder Hume's believe - by Mr Hume's brother, Flower's father - who forgot to file the renewal of an insurance policy leading, after a fire, to the loss of the family business due to forgetfulness in the glow of his marriage to Elizabeth's young teacher. Since, the family in the north have toiled to repay the debt. TheHumes have grudgingly agreed to take the child, who has no idea of the family schism and arrives in a glow of goodwill, excited to meet these mysterious relatives. She finds a household filled with tensions and secrets, resentments and ill-feeling, overseen by the enigmatic Yoshida, the family's remaining servant who is cook and housekeeper rolled into one. Routine is highly prescribed, according to the standards they were once accustomed to - one dresses for meals, tea is taken in the drawing room, dinner has many courses, even though the courses are characterised by their paucity and repetitiveness. Mr Hume lives an oddly solitary life, warped by the loss, and making no effort to rise above it and rebuild. Mrs Hume is neurotic and introverted, staying home all the time. Dennis is at university - what money can be spared goes towards his fees, books, and an allowance to cover clothes and travel. Elizabeth is also at university - but no money is allocated to her, as she is there in opposition to her father who doesn't believe she should be going, so her life is one of constant scrimping and saving, making her very bitter. Flower makes a special friend of Dennis, who, realising how very lonely and out of place she must feel, takes pains to spend time with her, buying her a swimsuit and teaching her to surf, introducing her to those of his friends they meet on their outings so that her friendship circle expands, including the young medical student, Oliver Warren (Warry), a young man known to Elizabeth from university whom she scorns - mistakenly - in her prickliness, assuming him to be condescending simply because he is wealthy. In fact, he is wholly admiring of her intelligence and would like to kow her better, and has baggage about his own background. Gradually Flower wins over Mr Hume - demanding of him that he take her surfing when Dennis isn't available. The exercise begins to have a positive effect on him and his outlook changes. She meets Warry's mother on holiday in Manly and engineers tea parties with Mrs Hume, despite Elizabeth's protests - Elizabeth who fears their poverty will be exposed. Eventually, she presses upon Mrs Hume to leave the house and go with her one afternoon to the Corso - Manly's promenade. Although still unwilling, Mars Hume eventually agrees. Finding themselves without money to buy tea, Flower runs back to the house to fetch a picnic and discovers Yoshida in the process of robbing the family of their money - the annual sum sent by Flower's father that is never banked, but is hidden in the house and sparingly drawn upon throughout the year for all their needs - the reason Mrs Hume normally never leaves the house. Yoshida, thinking he's bluffed Flower, puts together a picnic for them and agrees to take it to Mrs Hume while Flower stays in the house until he returns. Elizabeth, returning home and taking the long, but free, walk up from the ferry is brooding on her difficult day, hoping that Flower might be home when she arrives - even her prickly surface isn't immune to Flower's charms. But what awaits her is Flower's crumpled form at the bottom of the large pine tree in the front garden; Flower with broken bones and terror in her eyes who cries only for Warry to come and make her better, and screams when Yoshida's name is mentioned. Flower slowly mends, but the hurt she has nursed all these long months being separated from her family, especially her bother Chippie, eats away at her. Eventually, Mrs Warren, Warry's mother, sends a cable and miraculously one day, Chippie arrives. Chippie, more aware of the genesis of his family's circumstances, isn't always discreet, and the senior Humes learn some truths about the way their relatives have struggled, doing without to send all they could every year, while they have merely sat and lived off that money, growing more and more bitter. Meanwhile, Warry's father has helped Mr Hume to some investments, which have borne fruit.Mr Hume writes a letter to Flower's parents, discharging their debt and begging them to leave North Queensland and come back to Sydney so that they can mend the family. And all ends happily ever after! Turner explores a common theme here that can be found in many of her books - the disparity between the haves and have nots and the way it affects them. Flower, who has grown up with nothing, and with parents who have every right to resent that all their hard work goes to support another family, has been protected by her parents from that information and is a sunny little soul wishing everyone goodwill. The Humes, blaming Flower's father and dwelling on their losses have become bitter and twisted, their attitudes tarnishing every endeavour and crippling them far more than the northern family's straightened circumstances and difficult life does them. Flower is the catalyst of change and ultimately, of redemption for most of the other protagonists in the story. It is a whimsical tale, but for all the whimsy, it is underpinned by Turner's own experience of contriving and making do in order to keep up with Sydney society in her day. Her diaries reveal that she and her sisters spent their small allowances refurbishing dresses over and over because they couldn't afford new ones. I love it and re-read it regularly. I don't know how many editions were printed of this one, but it's not in print now - nor is it to be found in contemporary library collections. I ran my copy down in an antiquarian bookstore many years ago - I was on a roll discovering Turners at the time! It is quite delightful, and definitely one of my treasures. I've never heard of Ethel Turner, but I love whimisical tales. Your copy of it is beautiful, I'd love to see pictures of your bookcases of vintage children's books! I found your comment early this morning and have been thinking about where to place Ethel Turner. She's certainly one of Australia's most well loved children's authors. I guess she'd be to us what L.M. Montgomery is to Canadians. Her stories are all about families, with a focus on the children, and growing up in Australia - some Sydney-based, others in the country and a lot of them a mixture on both. I did a more general post on her absolutely ages ago - I'll add a link back to that post (there's a pic on that post of the shelf where my Turners live that shows about half of them...) but perhaps I might do a more specific biographical one. Seven Little Australian is certainly the best known of all the books, and one you should be able to get your hands on. It was televised back in the 70s - and was done very well. It's time the bookcases got a thorough dust and tidy up, so p'raps I'll do that and take some pics and do a post so you can see them all! I would love to read this, my own favourite (although I love all I have read) is the Secrets of the Sea. I can post a picture of the cover if you like. Hi! Welcome to my blog. I don't know that one...I'd love to see your cover pic!